On peak of hill with Breathtaking View, near Falassarna, Balos, Elafonisi. The villa is a 2 storey stone built house. On ground floor there is a spacious living-dining area with fireplace, kitchen(fully equipped), twin bedroom with balcony ,Shower/WC. On upper floor there are 2 spacious bedrooms (1 double bed - 1 twin), bathroom with jacuzzi, a balcony and an enormous veranda with such a view that you feel you are watching from an aeroplane. 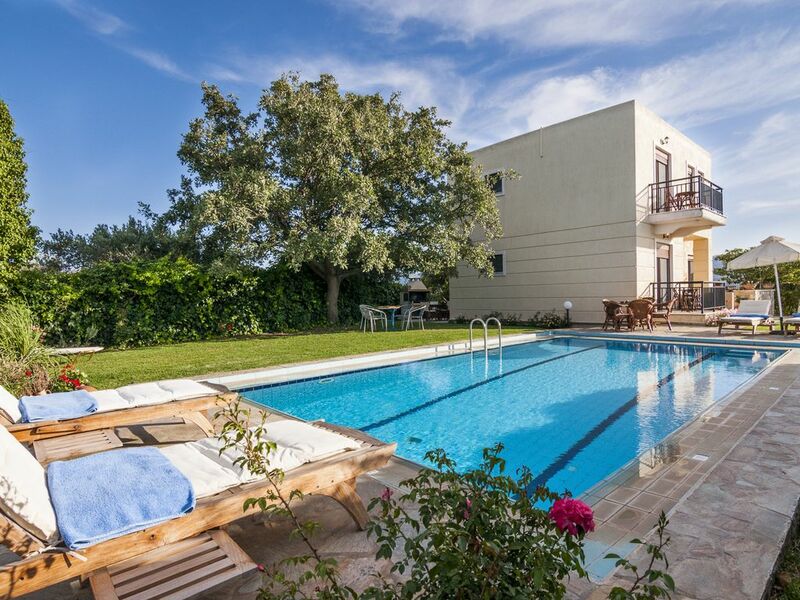 The villa is situated in a private piece of land next to fields, full of olive trees. You can swim, sunbathe, have a drink, relax away from it all. I'm a husband and a father of two sons.I enjoy listenting to music and hang out with good company. There is no other place offering, absolute privacy and relaxation all combined with a breathtaking view!!! The excellent view from the terrace is going to stun anyone. The modern architecture that combines old (stone walls) with luxury. Finally the relaxation that offers, because the only noise you can hear is the noise of birds singing. The villa stands on the middle of a big land property, on the top of hill which gives an absolute privacy (suitable even for nudists). In general is a luxuriously furnished villa with very good taste and first quality items. The description of this beautiful villa is absolutely accurate; if anything it does not prepare you fully for the tremendous stay you are about to have. It is like living in the comfort of your own home-spotlessly clean, plenty of towels and linen, a well equipped kitchen, two good bathrooms, air conditioning, a music centre with CDs, games, candles, a BBQ, you need to take nothing! This is outdoor living at its best. With two teenagers we had a wonderful week. Plenty of room for us all to have our own space, long lazy days sunbathing and reading by the pool( it was actually very difficult to drag ourselves off anywhere!) magical sunsets over the sea and sitting out at night looking at millions of stars in total isolation.You do need a car to get around as the villa is set at the top of the hill (which gives a welcome breeze) surrounded by its own private well tended garden with a green lawn, shrubs, roses and geraniums and across the lane nothing but olive trees on the slopes downwards. The local town of Kissamos (10 mins drive) is not at all touristy in a brash sense but there are plenty of supermarkets with fresh local produce and good, reasonably priced places to eat along the sea front-the atmosphere at night is lively but not loud. Chania,about 30 mins eastwards on the national road (take care,it's a fast, dangerous road with poor lane markings) is well worth some visits, especially the harbour and the old town. Falasarna beach is like paradise, sand and blue water with fantastic sunsets from the little bars(again,off the beaten track so amazingly uncrowded even in August), the south coast is within easy reach and walking the Samaria Gorge is a must! Start early to avoid the midday sun, took us 5 hours with 2 stops en route. Very popular, lots of springs to wash your feet and get water and towering awe inspiring limestone scenery. A great achievement but the dip in the sea at the end is much needed! Check out your return route carefully, boats and taxis are not that frequent.To sum up, this villa is ideal if you don't like crowds, if you want to experience life in the hills of Crete with no-one around but like to be close enough to have things to do and places to eat out. We were made to feel very welcome- a bottle of wine,some olive oil and a video of Chania were presents on arrival and we have never stayed anywhere quite so dreamlike. Arriving back to the grey skies of Britain it was hard to believe it had ever happened.We will definitely return. Siamo appena tornati da due settimane favolese nella Villa Kalliani, innanzitutto è doveroso sottolineare la splendida accoglienza avuta dai proprietari persone squisite che fanno di tutto per metterti a Tuo agio e per aiutarti per ogni necessità. Le foto che vedete rispecchiano fedelmente ciò che troverete, le stanze tutte ben curate e pulitissime, la piscina e soprattutto la vista sul golfo di Kissamos è strepitosa. Il Luogo è isolato immerso in una collina piena di ulivi, l'unico rumore che sentirete è il canto delle cicale...per mangiare nelle vicinanze è pieno di "Taverne" a Voi la scelta di quale provare tutte offrono un buon prodotto e l'ospitalità che troverete sarà veramente unica; market e supermarket sono a 5-10 minuti di automobile assolutamente necessaria per soggiornare a Villa Kalliani. La spiaggia più vicina tra quelle più famose è quella di Falasarna a circa 14 km, a 45 minuti vi è la bellissima Elafonisi oppure Paleochora. La splendida città di Chania di cui vi consigliamo la visita (il Porto Veneziano e la Old Town meritano più di un giro). I bambini hanno vissuto la Villa come a casa propria e la bellissima piscina permetteva di rimanerci per ore senza annoiarsi, di notte il cielo stellato rintempra il cuore e la mente. Insomma è stata una vacanza bellissima che consigliamo a tutti !!! Cherethiana is a small typical, picturesque Cretan village on western Crete. High up on a hill 2.5 Km away from the sea,40 min from Chania airport, 30 min. from Chania town,10 min. from Kissamos town, 5 min to nearest beach and in a range of 20 min driving, you can reach the top rated beaches in Greece such as Falasarna, the exotic beauty beach of Balos, Elafonisos and south Crete coast etc. Other Activities: Bird watching, star watching.